Are you interested in building your coaching skills? · systems thinking for creating engagement, flexibility, enhancing self & team effectiveness and resilience. Please email Sue sue@whitespacecoaching.com to request more details and/or to book your place. This free workshop welcomes men and women who have completed (any type of) cancer treatment and are looking for ways to support themselves in their recovery and to regain confidence. This workshop has been developed by by 2 CCC coaches Dr Jo Lee and Isabel van der Ven, both cancer survivors. It will be inspiring, motivating and fun. Create your personal plan to move forward by setting realistic, achievable goals and action planning. Participants will leave this workshop with increased awareness, a more positive mindset and practical tools that will lead to an upward spiral of improved confidence & resilience, social support, more control and improved well-being. Maximum of 20 maximum with 2 facilitators. Cancer Research UK forecast that almost one in two of us will get cancer in our lifetime. As medical treatment improves, more of us will survive cancer for longer. 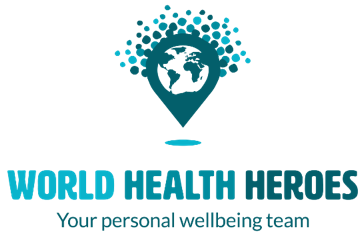 World Health Heroes (Salisbury) have coaches and therapists who provide support to cancer patients, survivors and their loved ones. Cancer Coach Ross Nichols. Cancer coaching is a holistic blend of coaching methodology and support, enabling individuals to deal successfully with the impact of cancer on their lives and to move forward from it in the way that is right for them. Cancer coaching can help with your attitude to your cancer, which is key to your wellbeing. The mental dimension of cancer is as important as the physical. You can choose to embrace the opportunity to re-prioritise your life and live more joyfully. This 1 hour talk on cancer coaching explains why the need for cancer coaching continues to grow and what cancer coaching is. It also covers how cancer coaching is provided and the benefits of cancer coaching. This 30 minute talk on cancer coaching explains why the need for cancer coaching continues to grow and what cancer coaching is. It also covers how cancer coaching is provided and the benefits of cancer coaching. The workshop will take place on Wednesday 7th February 2018 from 9.30am to 1pm at the Shelter offices in London EC1 – full details can be found in the attached poster. 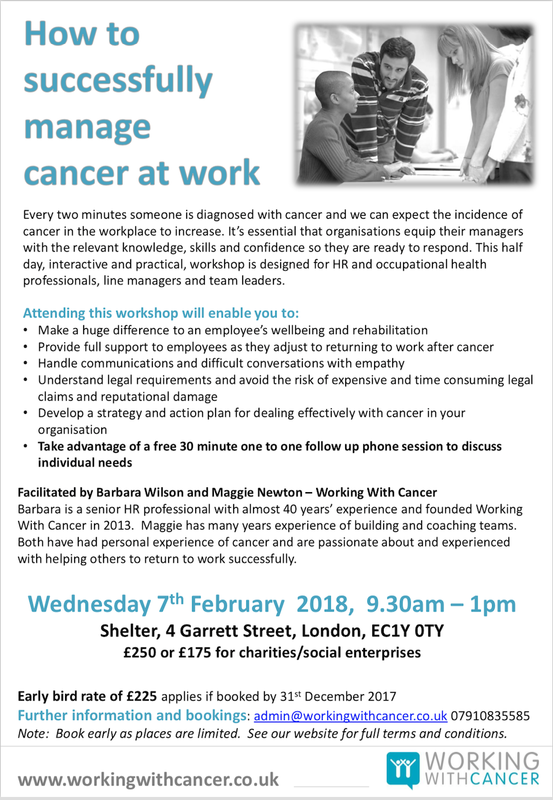 For further information and to book a place please email admin@workingwithcancer.co.uk or call 07910 835585. Emily is an Ex NHS health psychology specialist and coach. She supports people to move forward from cancer and lead gentle lives. A cancer survivor with her own infertility story she brings a wealth of knowledge and experience in understanding the complexities of these two life traumas. This webinar Coping with both cancer and fertility. It will be an opportunity to discuss managing emotions – anger, guilt, jealousy and overwhelm – and to look at strategies to move forward with compassion, calm and focus. If you would like to register to be part of the Cancer and Infertility Webinar please email Cat@fertilitynetworkuk.org stating the webinar title in the subject. As we live longer, and as medical treatment improves, more of us will get cancer and more of us will survive cancer for longer. The number of people who live under the shadow of cancer is therefore growing and will continue to grow. Cancer coaching is a holistic blend of coaching methodology and support, enabling individuals to deal successfully with the impact of cancer on their lives and to move forward from it in the way that is right for them. Cancer coaching is a new field. I’m one of the founder members of the Cancer Coaching Community, which formed in UK in 2017. The Cancer Coaching Community’s vision is to be the UK organisation that champions coaching for people affected by cancer, to support them to move forward from their cancer experience. Cancer coaching can help with your attitude to your cancer, which is key to your wellbeing. The mental dimension of cancer is as important as the physical. We can choose to embrace the opportunity to re-prioritise our life and live more joyfully. The paradox here is that some people are happier with cancer than they were before they had cancer. FREE – please book your space in-store, or call 01722335965, or by visiting wellnatural.co.uk. For more information about this talk, please contact the speaker Ross Nichols. A live workshop hosted by Emily Hodge within the Moving Forward from Cancer Community group (you'll need to request to join if not already a member). We can be pretty negative towards ourselves after cancer - 'did I cause this', 'I'm not a good enough survivor' and 'I've got to get on with things now' being quite common phrases I hear. Let's have a chat about where this is coming from and how we might help ourselves bring kindness and compassion to this critical voice. Look forward to seeing you Live on the day. If you can't make it the video stays up on the group feed to watch later. This workshop @ Fleming Park Leisure Centre welcomes men and women who have completed (any type of) cancer treatment and are looking for ways to support themselves in their recovery and to regain confidence. The workshop has been developed by 2 CCC coaches Dr Jo Lee and Isabel van der Ven, both cancer survivors. It will be inspiring, motivating and fun. Number of participants: max 20 maximum with 2 facilitators. You might not fancy it but are intrigued about how it works, and indeed how it might work for you? Or perhaps you have a practice of some sort and want to know how it can benefit you after cancer? Join Emily Hodge of www.coachingemily.com and Natasha Brittan of www.natashabrittan.com on this live session to find out why meditation is getting so much attention and how you can make it work for you in your life after cancer. You can register for this free webinar here. A lot of the time we feel under to be doing, to be busy, to be achieving – something, anything, lots. Whilst having purpose, focus and goals in our lives are important, it’s important we don’t strive for them at the expense of our health and wellbeing, our sanity and our time. What if we could lead a life that felt aligned to what we want but was also kinder and more gentle in our pace to get there? What if we could learn techniques and be held accountable to carrying them out to lead a more gentle life overall? In this facebook live, Emily Hodge will be introducing the elements of leading a gentle life and how you might get there. What do you say to friends and family when you don't know what to say yourself? How do you mention the experience to strangers or new people in your life? In this Facebook live video, Emily Hodge will cover some of the ways we struggle to do this and how we can communicate what's right for us. Live feed for members of the group. useful resources for further help and support. This workshop is open to anyone with any form of cancer and is run by Lymphoma Association, Working With Cancer and Shine Cancer Support. This workshop welcomes men and women who have completed (any type of) cancer treatment and are looking for ways to support themselves in their recovery and to regain confidence. We don’t often think about resilience until something comes along to knock it down and make us feel vulnerable. In this workshop for Shine Cancer Support, Emily Hodge of coachingemily.com and a founding member of the CCC, will facilitate discussion and exercises within a forum style for attendees of the Shine Connect Conference. You’ll leave understanding your personal levels of resilience and how to build in strategies for increasing resilience and reactions in future. This workshop has been developed by 2 CCC coaches Dr Jo Lee and Isabel van der Ven both cancer survivors. It will be inspiring, motivating and fun. With high rates of anxiety and worry even after a cancer experience is over, finding the right support for you is important in your recovery. One technique that CCC founding member and coach Emily Hodge has found beneficial to use both on herself and with clients is Emotional Freedom Technique, or EFT – also known as ‘Tapping’. How to register: To watch this live support session, you’ll need to be a member of the moving forward from cancer facebook group which is run by Emily Hodge exclusively for people affected by cancer. If you can’t make the date of this video, by joining the group you will have access to all the recordings. Exercise after Cancer – what’s right for me? After cancer we hear so much about what we should be doing to stay healthy, including exercise. But how do we know what's right for us and the kinds of movement and fitness levels we can expect, even years later? Emily Hodge of coachingemily.com and founding member of CCC, and Mary Huckle of breakthroughfitness.co.uk co-host this unique live session. In this workshop for You-Can, Emily Hodge of coachingemily.com and a founding member of the CCC, will facilitate a small residential group to understand the signs of resilience levels rising and falling, establish how to build personal resilience and work through real life scenarios to prepare for in the future. Mental health issues are more likely to be diagnosed in people following a cancer experience. Anxiety, and particularly panic, are common amongst cancer patients and can occur in their lives even when they’re moving forward from the experience. Emily Hodge, a founding member of the CCC, provides guidance on understanding panic and how to support yourself before, during and after a panic episode in this exclusive live video. To watch this live support session, you’ll need to be a member of the moving forward from cancer facebook group which is run by Emily Hodge exclusively for people affected by cancer. Pls RSVP if you'd like to come, thank you. Moving forward from cancer: what's my life plan now? You're out the other end of your cancer diagnosis and yay, It's over! But it's not really over is it. It's kind of, sort of, always there right now and the constant questions from you and others about what you're going to do from here are looming and lurking and ever present. Because there's nothing like cancer to remind you that you want to now get clear, focused and purposeful with your time. Well, let's explore that a little together in this hour's session and see how we can help you get some clarity.